Education is one of the five thrust areas in the UNP manifesto presented in the 2015 general election. The other four are: Developing the economy, Combating Corruption, Ensuring freedom and Investing in infrastructure. Infrastructure includes ‘hard’ infrastructure such as housing, transport and roads and the environment. Interestingly, health and welfare, the aim of which is a healthy society, is included under infrastructure, but, education, another ‘soft’ infrastructure is singled out as a thrust area of its own, reflecting its relative importance. Looking at all five thrusts, I feel that the education thrust is the weakest in terms of the believability of the gains promised because the plans are not linked to a convincing theory or a driver of change. Good manifestos or well-intentioned leaders are not sufficient to bring about change. Each change has to have an underlying causal mechanism, a theory or a driver of change. Causal mechanism is a term used in social sciences to describe the cause and effect link that underlie social phenomena. Theory of change, a similar term used by development agencies, is a credible explanation as to how a proposed set of actions will lead to the desired outcomes. The term driver of change is perhaps more suited to a general discussion on change. I will be using all three terms as appropriate. The promises on governance by the UNP are indeed believable because we have seen the drivers of change in action. In his address to the nation on 14 July President Sirisena outlined four reasons why the former President shall not win the general election if he chose to contest. Two of those reasons are significant here. He said globally the tide has turned against corrupt and undemocratic forms of government. Secondly, he said, civil society and the youth in this country too are firmly for good governance. We have already seen the 19th Amendment in action during the past election which has been described as the most peaceful election conducted in the recent history of this country. The governance promises of the UNP are indeed believable, but, civil society and our youth have should continue their vigilance. The UNP has chosen a competitive and market-driven path for developing the economy. They use the term social market to soften the hard image of a market-driven economy. For those who believe in the market as a driver of development, the UNP’s economic reform proposals make sense. However, there will be tremendous pressure from opposition to protect failing State enterprises and push the governing party away from its professed path. The chambers and media have a done a sorry job in the past in protecting market place, but they will have to do better in the future. There is no question that there was infrastructure development under the Rajapaksa regime. Unfortunately, the driving force behind this development was autocratic decision making and what one might call productive corruption. It is indeed widely believed that kickbacks from contractors cascaded down from the top to the very bottom to oil the wheels of political and bureaucratic machinery. These morbid drivers of change are not sustainable in the long run. But what will take its place? A recent study had shown that doing away with corruption will slow down growth unless corruption is replaced with efficiency in government. What will drive efficiency in government? The new government needs to give more to that. Education, school education in particular, is an area where is efficiency of government is paramount. More importantly, radical new ideas are needed here. Fixing education is like rebuilding a ship while it is sailing in a rough sea. Today’s parents are a nervous lot. Competition is tough and they are not willing to experiment. They feel they have mastered the ways and means (krama saha vidhi) of acing the system. Government may say it will reduce the class size to 35 and so on, but powerful parent group will resist change. The central school concept initiated in 1946 by C.W.W. Kannangara is perhaps one education policy that worked. During their heydays, the best and brightest in the each of the 25 districts got a chance to attend an exemplary school in their district. With time these schools lost their prestige. For reasons that are not sufficiently researched, in their place there has emerged a system of ‘popular’ schools which are concentrated in 33 out of the 93 education zones in the country. Each succeeding government has tried to spread these ’popular’ school more equitably. Whether called Navodya, Isuru, or Mahindodaya, the concept behind the initiatives are always the same —provide money for facilities and supplies and build capacity through training. To date none of these initiatives have been able to stop to tide. Parents from all walks of life continue to make it their life’s work to get their children into popular schools in major cities. The driving force behind the success of the central college concept, the reason for the slow deterioration of these schools and our inability to create anything even close is a question that should be explored further. Decentralisation and competition in public education? The new education Minster will be all pumped and ready to clean the system, but, like old Jacob Marley in Christmas Carols, I hope he gets to meet “ghosts of education reforms past” and realise the limits of a national Minister for education and his/her cadre of bureaucrats cloistered in Colombo. All political parties more or less agree on objectives of general education. 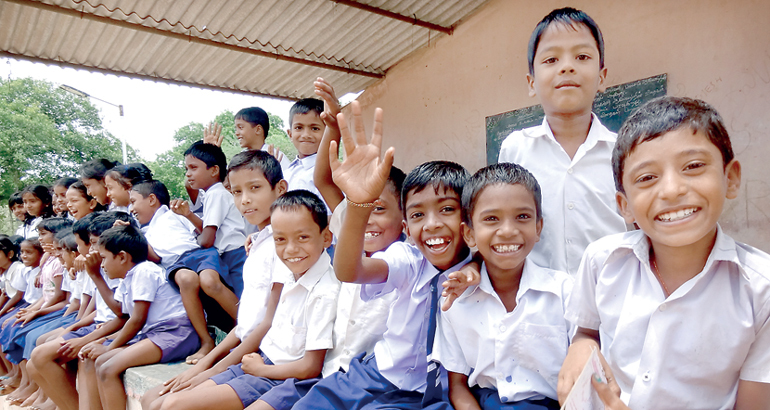 They want a more equitable distribution of resources across schools and a holistic approach education to replace the current examination-centred system. Proposed solutions too are similar. Increase expenditure, remove political controls, bring in a new education act, limit class size, and bring international schools to the national policy framework and so on. Unfortunately, attempts at reforms whether called Navodya, Isuru or Mahindodaya have achieved little. One notion I like to I like to explore in the next few columns is a radical decentralisation of education as a driver of reforms where the Ministry of Education functions only as an arbiter of competition in a system with a cascading flow empowerment and incentives from the central government to provinces, districts, zones and individual schools. But same old ideas new bottle? Some of the language in the UNP manifesto makes me hopeful. An oversight board is proposed and the word incentives is mentioned in the proposal for equitable distribution of resources to schools, but, the overall vision is still that of a ‘new and better’ minister in a ‘new and better’ administration charging a like knight on a white horse (except with the stated restriction on not postponing public examinations without Parliamentary approval) to save the schools. Sorry, been there, done that. It does not work.